Saturday 15th July 2017 was a day packed full of FREE Family Festival Fun! 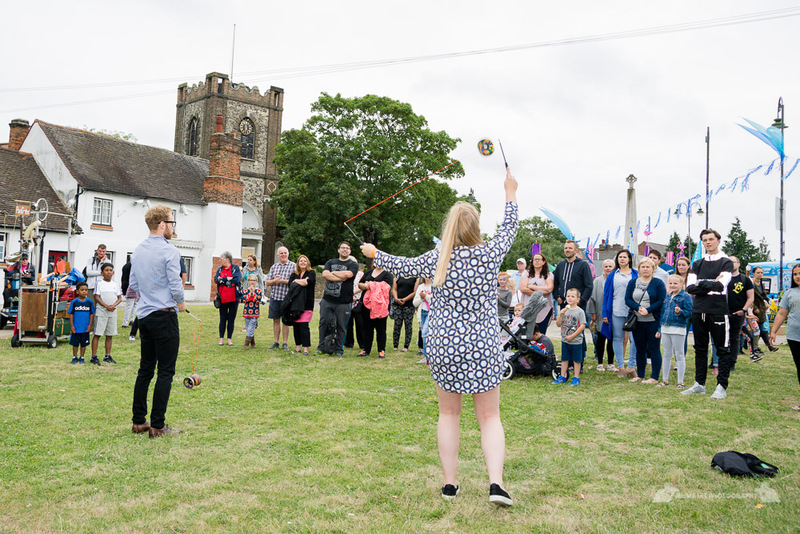 DAGFEST is Dagenham's outdoor festival of circus, music, street theatre and dance. And for 2017 there were circus performers, interactive theatre pieces, local community commissions and lots of homegrown talent on our new Dance Stage. DAGFEST was curated by our steering groups of local residents and was produced by Creative Barking and Dagenham. We would like to thank ALL of those who played a part in making the 2017 festival a success! The Studio 3 Arts stage ran a specially selected programme all day long! Sharlene Carter brought together local performers, dancers, singers amongst spoken word poetry, and a version of the Studio 3 Arts dance battle 3style Friday as well as a dance class with Jade Hackett and so much more! Sid Bowfin shared his love (and talents!) of the violin in a hilarious show with participation. We saw the Paparazzi who couldn't wait to grab some snaps and a story! The circus and acrobatic show from Light the Fuse Theatre and Scribbled Thought, Playground Victories, a huge playground! The Strong Lady wowed us with her strength and ability. We were taken on a journey into Lulu's world of clowning delights. Our Community Commissions offered LOCAL PEOPLE the chance to EXPLORE NEW SKILLS AND CREATIVITY! We made festival headdresses with Susanna Wallis. With Thinkarts! we celebrated you and your mind with a creative drawing and making, My Mind is Magical. Making noise and creating our very own drum and sticks with Green Shoes Arts. Random Generator brought their Screen Printing carousel to print your very own DAGFEST T Shirt. Our Get Creative workshops helped us to build momentum for the festival, from drumming away to creating and decorating flamingos in preparation for the fabulous finale procession. We had beautiful Caribbean food, burgers, hot dogs and plenty of cakes and ice cream to keep us going throughout the day. There was a range of craft stalls and local businesses and organisations who joined us. CHECK OUT OUR DAGFEST facebook event page, and share your pictures with us from the day by using #DAGFEST2017! KEEP YOUR EYES PEELED FOR INFORMATION AND UPDATES FOR DAGFEST 2018! WE CAN'T WAIT TO SEE WHAT THIS YEAR BRINGS!